Recently, I had a great chat with author Alicia Funk. 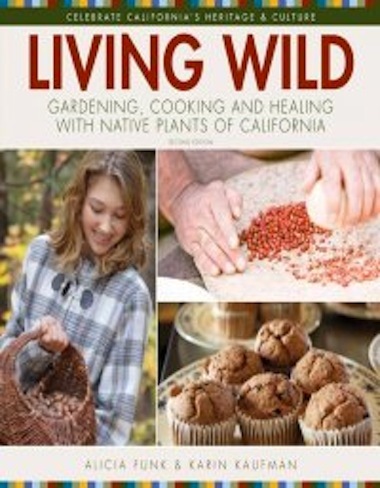 Her book, “Living Wild: A Taste of California’s Landscape” is a delight. CNPS is blessed to receive a bit of the proceeds, thanks to a generous commitment from Alicia. If you don’t know this book, please check it out. The photos are beautiful, it is well-laid out and graphically pleasing. A newly released 2nd edition of the popular guidebook is now available and it offers solutions to climate change that actually taste good. Alicia makes some interesting points. One that intrigued me revolves around the issue of foraging. We have seen an amazing increase in the popularity of urban foraging, locavore dining and vegetable gardening. As this happens, foragers may outpace the ability of Mother Nature in the wild to produce! But if we all gardened with a few local native edibles, we could increase their availability, and take a bit of pressure off the wildland-urban interface where most foraging occurs. You can buy the book through CNPS, and when you read it, please let us know your thoughts. I’d be happy to receive any plant information, anecdotes, arguments or discussions about all aspects of this fascinating topic. When we share, debate, study and codify information, we help ourselves, and we put in place aspects of the future.